Wish the youth lasts as the river flows forever. Wish the friendship between us is always there. When the young Chinese and Vietnamese students from Vietnam National University, Hanoi, sang this song in both of their mother tongues, they also sang their blessings to Sino-Vietnamese friendship and future ties. 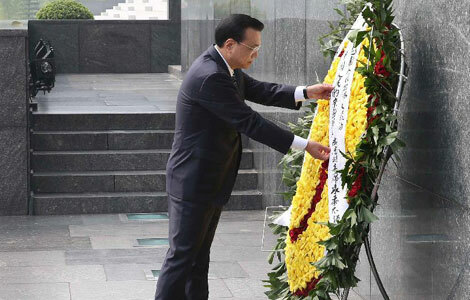 Premier Li Keqiang and Vietnamese Vice-Premier Nguyen Thien Nhan recalled the traditional Sino-Vietnamese friendship when addressing the university, urging the youths from both countries to continue the favorable ties. 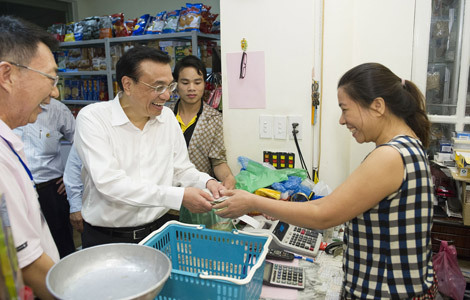 Although Chinese people were very poor during Vietnam's war of liberation in the 1950s and 1960s, they still made donations to the Vietnamese people, Li said. Li told the young students when he was young, each Chinese person could get limited food everyday, and most of it was only sweet potatoes. He said that China still sent rice to the Vietnamese people to support them during the war. To continue the traditional friendship between the two peoples, the premier called on students to play an active role in promoting Sino-Vietnamese ties in the future. 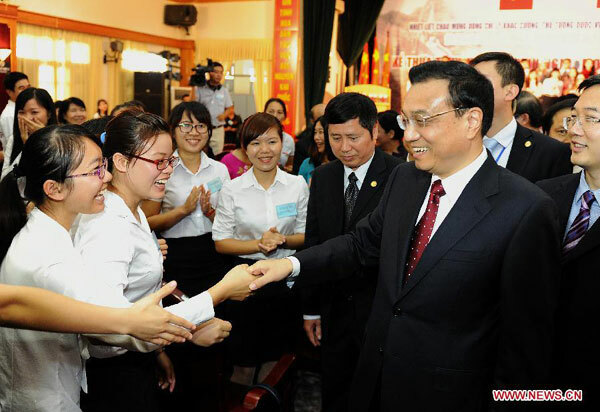 "The future of China-Vietnam ties is in the hands of the youth from the two sides. 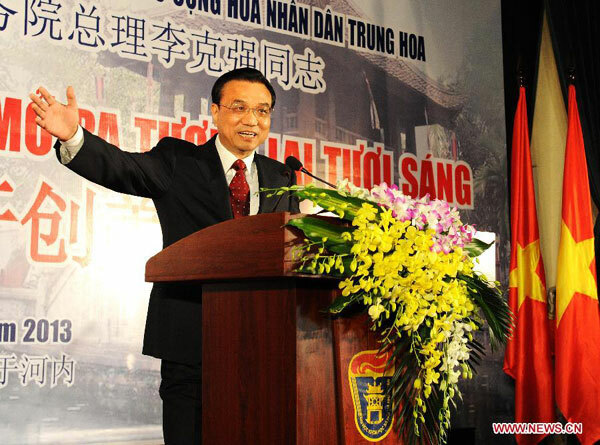 Long-term good-neighborly friendship concerns the overall relationship between the two countries," Li said, adding that he hopes the young can take over the baton of the traditional Sino-Vietnamese friendship. "Ties between the two peoples are the foundation of the friendship between the two countries," he added. He also encouraged the youths to value the time and study hard, so that they can have a solid academic foundation to improve Sino-Vietnamese ties in the future. "Li's visit will deepen the students' understanding of China," said Nhan, who studied in China's Guangxi Zhuang autonomous region when he was 8. Speaking in Chinese, Nhan encouraged the youths from both countries to make contributions to future Sino-Vietnamese relations. Li's visit upgrades the China-Vietnam ties to a new level, and his words to the youths placed the hope of the two countries on the young generation to further boost the bilateral ties, said Chu Hao, a researcher on Southeast Asia studies at the China Institutes of Contemporary International Relations. "Relations among the young generation play a very important role in future bilateral ties. 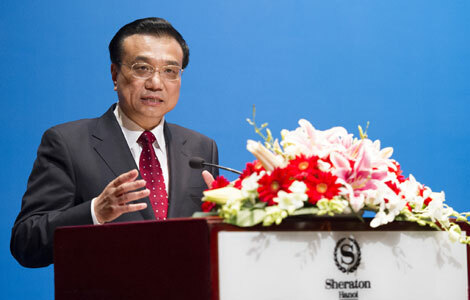 When the young have a fair understanding of the bilateral ties, China and Vietnam can have a bright future," he added. Qi Jianguo, former Chinese ambassador to Vietnam, echoed Chu's sentiments. "Some Chinese people misunderstand Vietnam due to untrue media reports. But if the young can understand more about each other, such misunderstandings will not exist, and the friendship between the Chinese and Vietnamese people can continue," he said. "If the young have a comprehensive understanding of the overall China-Vietnam ties, they will know that the South China Sea issue is only one point of the bilateral ties." 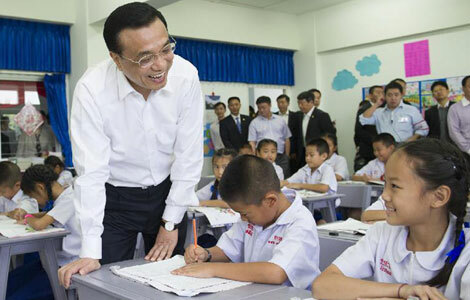 Encouraging more exchanges among young people, Li guaranteed that the Chinese government will offer more scholarships to Vietnamese students who want to study in China. Mo Jingxi in Beijing contributed to the story.